Marcia S. Byerly is an artist and an author living in North Carolina with her husband, a corporate pilot, and their dachshund, Jack. She began her venture into the eBook world with her desire to have "Aquilla, Indian Captive" published. This book was written years ago by her mother, an extraordinary, talented woman who spent 10 years writing this Young Adult story, but was never able to find a publisher. Now with self-publishing, Marcia is able to make her mother's dream a reality. In the process, Marcia discovered her own love and talent for writing and is now publishing The Adventures of Jonny Dimbo, a series of adult books that will charm you with its many memorable characters and keep you coming back for more stories and intricate plots. Secrets and mysteries abound in this adult series of books featuring Jonny Dimborowski as an investigator using his innate listening ability and less-than-lawful skills to help people find answers to a problem by someone who is very discreet and trustworthy. In this first book, you meet Jonny who talks about his childhood and the traumatic event that shaped his life. He also purposely eavesdrops on his mother’s psychiatric clients and learns that he can make money by keeping those people’s secrets. These same people come back to him when he is an adult to help them investigate a sticky situation. The Warden knows something is wrong at the penitentiary and calls on Jonny to check it out. In the end, all secrets will be revealed. In Book 2, The Mobster, Tony Moroni, calls on Jonny Dimborowski to help him spy on his son who has become increasingly distant and secretive to find out why. Tony knows that Jonny will be discreet and keep his trap shut, or else. After all, Tony has been paying him bribes for many years to do just that about his own personal secret. As Jonny goes about his work, he also learns about his mother’s dubious past and is shocked to find out her own secret. When a sinister man from the past threatens his mother, Jonny and Tony team up to take care of the matter in their own special way. In Book 3, The Priest, Father Dom, is frightened by the dangerous looking gang members who have been hanging around the church. When religious artifacts start disappearing from the church, Father Dom calls Jonny Dimborowski to find out if these men are the culprits as he suspects. As Jonny is investigating the thefts, a person from his past comes back into his life and changes it forever. Meanwhile, the gang terrorizes everyone in the neighborhood, including Jonny’s close friends. He and the Mobster, Tony Moroni, once again work together to exact a solution to the problem. In Book 4, the Judge’s safe is broken into and the thief steals evidence that implicates the Judge in a serious crime. He must get it back or his career would be over and his character destroyed. He calls on Jonny Dimborowski to quietly and discreetly find this man who is now blackmailing him. Jonny has known the Judge’s secret for many years and the Judge had been paying him to be quiet about it. Jonny knew the Judge to be a good man who unfortunately used bad judgment and so he wanted to help him. During the investigation, the thief hurts someone that Jonny loves and so he and his team members come up with a plan to wreak ‘Jonny Dimbo Justice’ on the man. In Book 5, the Pilot asks Jonny Dimborowski to investigate his mother’s finances because he has suspicions about who is taking large sums of money out of the trust fund. The Pilot owes Jonny a favor because Jonny has kept quiet about the Pilot’s secret life. Also, a young black man that Jonny befriended many years ago when he caught him stealing, owes Jonny for helping him to pay for college. When a girl close to Jonny is raped, he calls on both of them to aid in administering a large dose of ‘Jonny Dimbo Justice’ to the perpetrator. He believes in letting the punishment fit the crime. Aquill Lloyd is a bright, spunky 15 year old girl living in Bath Town, North Carolina in 1711. 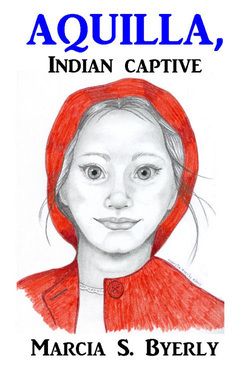 Her happy family life is torn apart when local Indians raid the towns. Aquilla is captured and this is her story of survival, hardships, friendships and more. She meets other captive women and children along the way, but all the time wondering about her own family: are they still alive? What has happened to her home town? Throw in the mix a very handsome white man who speaks French yet converses and lives among the Indians and things get very complicated for Aquilla. Come along for the ride as Aquilla fights for her life in a savage time.